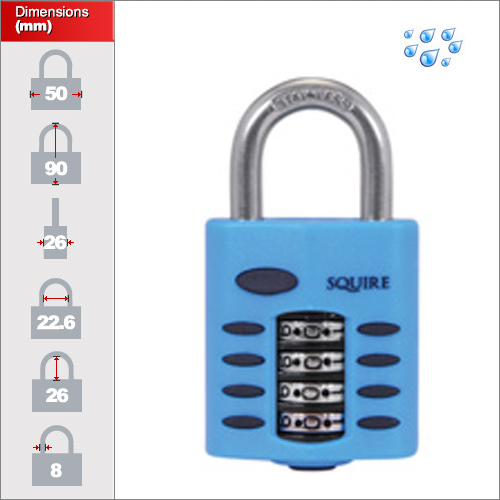 Marine combination padlocks tend to be quite pricey because they contain a lot of stainless steel. This range offers a smaller version compared to the ABUS 180ib and the MasterLock Stainless which are larger and more secure but also quite a lot more in terms of cost, and a larger version comparible in size and cost. These models were adapted from the CP Range which we also do and have proved very popular around the UK so we're not too worried about reliability since the mechanism is likely to be same tried and tested format. We're yet to see how it fairs long term but we're confident. The body is plastic but the shackle is stainless steel so rust should not be an issue. Needless to say it will need lubricating over time to remove deposits of salt or grit. An important thing to note is that the combination change facility is not protected. I.e. it would be possible for someone to change the code if they knew the correct code already. If you trust your staff or people that access the lock then this is no problem but if it is accessed randomly by unknown people then you might want to consider the ABUS 180ib since the combination can only be changed by you, with a special key. 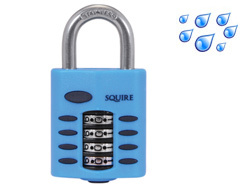 The padlock comes in two sizes. A 40mm version with a 6mm shackle and a slightly larger 50mm version with an 8mm shackle. Both have 4 dials and have the same internal mechanism.